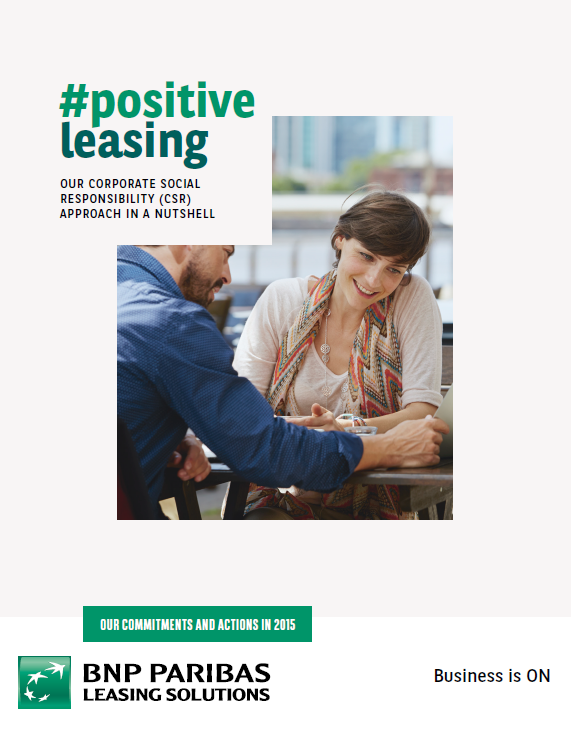 BNP Paribas Leasing Solutions encourages an approach to leasing which is increasingly more respectful of the environment, more responsible, more ethical and which shows greater social solidarity. To this end, we have written and implemented a Corporate Social Responsibility (CSR) strategy in all countries where we operate. We call it “positive leasing”. By helping customers and partners grow their businesses, BNP Paribas Leasing Solutions contributes to the real economy. When it comes to our ethics and responsibilities, we keep in mind the interests of all our stakeholders. This commitment is at the heart of the BNP Paribas Leasing Solutions brand signature, ‘Business is ON’, and underlines our promise of value. For maximum impact, it’s important that this commitment is meaningful to clients, partners and society as a whole. To achieve this, each company employee embodies this spirit of responsibility in their daily work. Economic responsibility : financing the economy in an ethical manner. Social responsibility : developing and empowering our people in a responsible manner. Civic responsibility : being a positive agent for change. Economic responsibility : combating climate change. In line with the BNP Paribas Group strategy, BNP Paribas Leasing Solutions has developed its own vision of CSR.